Motobecane bicycles have a particular place in the hearts and minds of vintage bikes buffs, especially those of us who were first introduced to lightweights in the 1970s. Established in 1923, by 1984 Motobecane had become a top French brand with 2000 employees. Later it became as "MBK." In very recent years, this brand has reappeared on mail-order Chinese-made bikes, apparently as a result of a licensing arrangement. 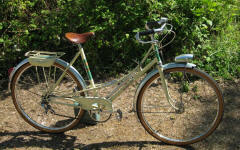 An elegant 650b woman's "Berceau" (cradle) style bike circa 1960s. A pseudo racing model wih tighter geometry. Competed with Gitane Interclub. No holds barred handcrafted racing model. Usually full Campagnolo. Appeared to be made by different "hands."